The Texas Longhorns are no strangers to receiving special Nike KD shoes – the Kevin Durant alma mater connection seems to guarantee them pairs every year. 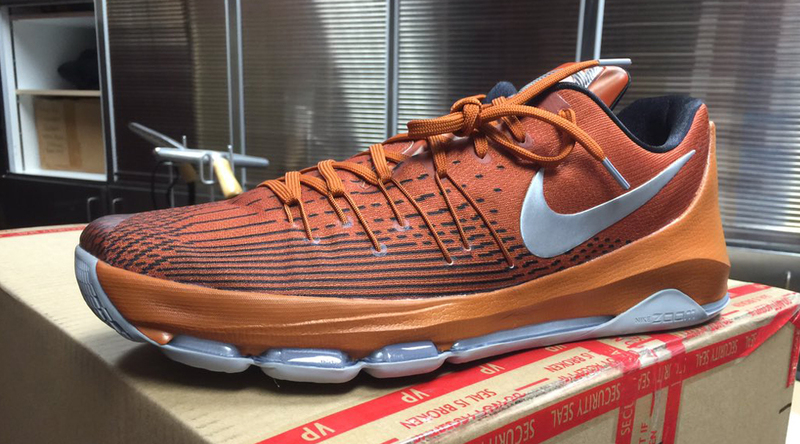 Today the school's basketball program showed off this, another "Texas" Nike KD 8 PE. This one takes advantage of the burnt orange part of the squad's palette, using it on the midsole and for most of the Flyweave upper. Nike often brings Longhorns flavored KD sneakers to retail, but there's no sign of that yet for Durant's latest signature shoe.